The line of people stretches out the door at Munch’s Burger Shack in Tokyo. The tiny eatery serves American-style hamburgers, among other things. Many of the people who line up have come from far away to try the food. Haruyuki Sano traveled 1.5 hours for a hamburger. Sano and others are eager to try the same hamburger that United States President Donald Trump ate here last week: the 100 percent U.S. Angus beef Colby Jack Cheeseburger. 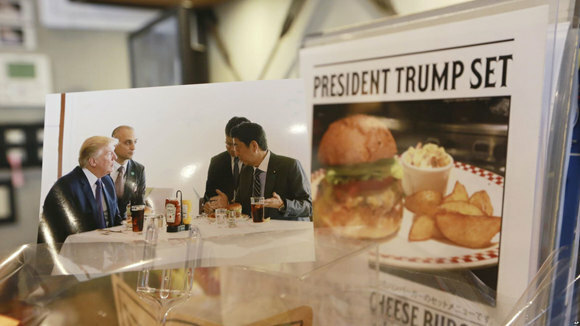 Trump ate a Munch’s burger with Prime Minister Shinzo Abe during his visit to Japan. “It tasted great, like steak,” Sano said after tasting the burger. Trump’s tough talk on trade and security does not always get positive responses in Japan, which sees the U.S. as its most important partner. But his love for the Japanese version of the American hamburger is popular with many here. “I like Trump,” said Sano. He adds that putting one’s country first makes sense. He thinks Japan should do that, too. While better known for foods like sushi and ramen, Japan has long enjoyed American food. So-called “premium burgers” are growing especially popular. Munch’s Burger Shack now offers the “President Trump Set” on its menu. It includes the burger along with coleslaw and french fries. It sells for 1,400 Japanese yen, or $12. He says the “President Trump Set” is now one of the most popular options on the menu. The experience of eating at restaurants in Tokyo is increasingly about fun storytelling, says Jotaro Fujii. He is a Tokyo-based food expert. This storytelling usually includes sharing photos of meals on Instagram. He expects the “Trump effect” for Munch’s Burger Shack to be huge. He throws back his head; stretches out his legs; and begins to whistle. They shook hand after their argument and parted as friend. 5.He adds that putting one’s country first makes sense. 6.It includes the burger along with coleslaw and french fries. The problem of pollution arises along with the rapid development of industry.